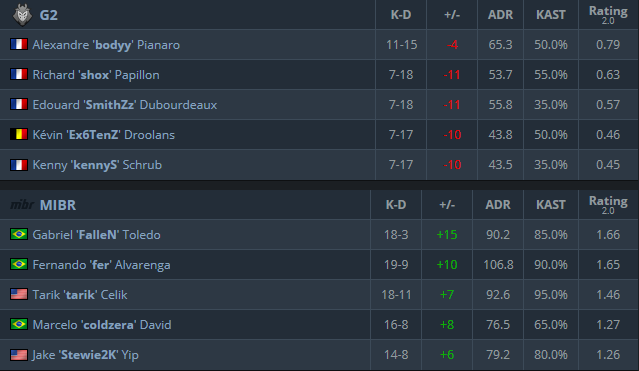 MIBR looks like it’s back in their famous form when they’ve ruled the work. G2 was on receiving end of that form which didn’t end up as positive thing. MIBR started well as they’ve taken pistol round and following two for 3:0 lead as CT.
G2 managed to stop that spree but not for long. MIBR simply dominated their CT side as they collected next 8 consecutive rounds where in most of the rounds it wasn’t even challenging. G2 has won two more rounds by the end of the half but it was too little and too late, as half finish with huge 12:3 in favor of MIBR. With such big lead it was only matter of time when will MIBR close our the game. G2 managed to get one more round but MIBR won 4 needed and finished the game with ease 16:4. Best players in MIBR were Fernando “fer” Alvarenga and Tarik “tarik” Celik but rest of MIBR was so dominant that last player Jake “stewie” Yip(79.2) had more ADR than best player in G2 – Alexandre “boddy” Pianaro(65.3).